Day 1: Arrival at Kigali Airport and Transfer to Bwindi Forest. On Arrival at Kigali International Airportfor our 10 days Uganda gorilla trek Africa adventure start with Kigali city tour as we visit the Kigali Genocide Memorial and transfer to Bwindi impenetrable forest national park for night over at Rushaga Gorilla Camp (Midrange Option). Meal plan Lunch and dinner. 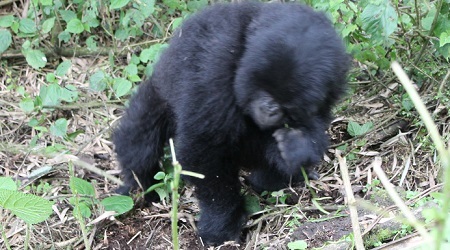 Day 2: Bwindi Impenetrable National Park-Batwa community experience. This day will be less stressful, after breakfast we shall take you to visit the Batwa community enjoy the cultural experience exhibited by the Batwa and communities around Bwindi Impenetrable Forest and after you will return to the lodge for lunch and have free relaxed evening preparing for following Gorilla trekking adventure. Overnight at Rushaga Gorilla Camp (Midrange Option). Meal plan Lunch and dinner. This day is dedicated to you for your ultimate Gorilla tracking experience in the Bwindi impenetrable forest this will enable you experience the real African forest Ecosystem. Hence spend another night at Rushaga Gorilla Camp (Midrange Option). Meal plan Breakfast, Lunch and dinner. Leave the lodge in Bwindi after breakfast and transfer you to Queen Elizabeth National Park to Ishasha sector, do game drive around the park in search for tree climbing lions and spend night at Ishasha wilderness Camp (Luxury option). Meal plan Breakfast, Lunch and Dinner. 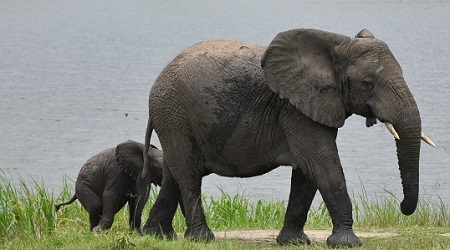 Day 5: Queen Elizabeth NP- Morning game drive and Afternoon Kazinga channel Boat Cruise. After an early morning breakfast you will leave for short game drive in Ishasha and thereafter drive to Kasenyi area also part of Queen Elizabeth National Park and later check in at the lodge for lunch before going for afternoon Kazinga channel boat cruise and back to the lodge after 2 hours for dinner and overnight at Mweya safari lodge (Luxury option). Meal plan Breakfast, Lunch and Dinner. After breakfast at the lodge we shall take you for morning game drive around the Kasenyi area for another wildlife experience and after drive to Kibale forest National Park the Home and capital of the chimpanzee and different species of primates, on arrival you will check in into your lodge before we take you for guided nature walk in the Bigodi swamp and spend night at Kibale forest camp or chimpanzee forest Guest House (Midrange lodges). Meal plan Breakfast, Lunch and Dinner. Day 7: Kibale national park-Chimpanzee trekking and Transfer to Hoima. After breakfast you will be taken for chimpanzee trekking in Kibale forest and later you will be driven to Hoima for a night to break the long drive to Murchison falls national park, overnight and dinner at Hoima cultural hotel (Midrange lodge). Meal plan Breakfast, Lunch and Dinner. Transfer early morning to Murchison falls National Park through Hoima as you view the beautiful escarpments on your way to Murchison falls and on reaching the park we shall take you to visit the Top of the falls and after check in at the lodge for late lunch and after we shall take you for an evening game drive and after you will return to the lodge for dinner and overnight at Paraa safari lodge. (Luxury option). Meal plan Breakfast, Lunch and Dinner. Day 10: Transfer back Kampala via Ziwa Rhino sanctuary and drop off at Entebbe. The 10 Days Uganda gorilla trek Africa from Kigali adventure comes to an end as we drive back to Kampala city, with visit to the Ziwa Rhino sanctuary for Rhino tracking and drive to Kampala city, do short city tour of Kampala before dropping you off at Hotel in Entebbe over night at Boma Guest house. Meal plan Breakfast, Lunch and Dinner. Gorilla trekking permit for each person. Note: Thank you for choosing to travel with us, we wish you the best of Uganda 10 Days wildlife experience.